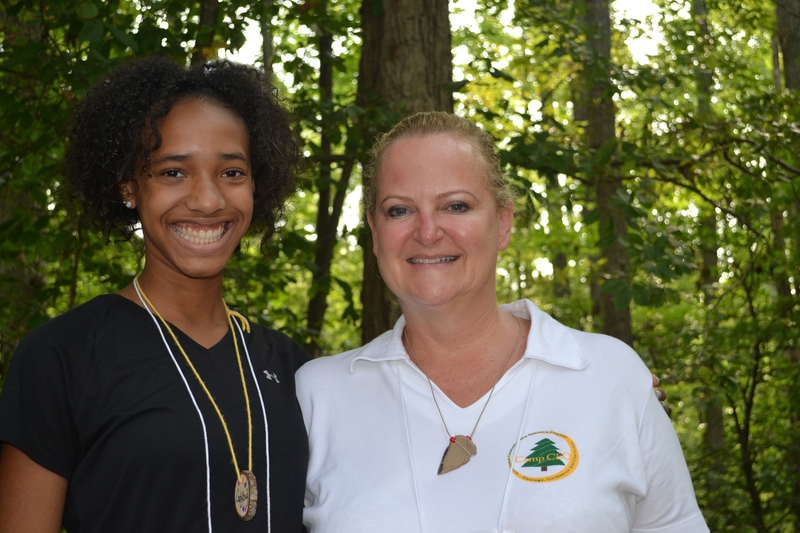 This summer I had the honor of being invited to Girl Scout Camp CEO by Lidia Soto Harmon, CEO of the Girl Scout Council of the Nation’s Capital. I arrived at camp at 9 am, Tuesday, August 7. After taking my bags to my cabin, I joined the group at an outdoor amphitheatre where they were listening to a panel of four CEO’s tell their life stories. I saw about 25 girls ranging in age from 14-18, 10 camp counselors and staff. After the presentation there was a question and answer session. I was struck by the high level of interest and outgoing nature of the campers. They were taking advantage of every opportunity to learn from the CEO’s. At the conclusion of the “Inspirational CEO” session, we made our way to the cafeteria for a class on making and canning salsa. I got to make salsa also! We were taught how to cut safely and mix delicious, ingredients, most of them grown at the camp garden. The girls had great moments of inspiration. I was so impressed with their thoughts, their character, and their excitement with this exercise. After each girl stopped and told the group what inspired her, the rest of the girls would relate the inspiration to a current popular song and the entire group would start singing. I could not believe how well they were able to relate the inspiration to a song, and I was deeply moved by this experience. Some of the songs were: Lean on me, We are Family, You are so Beautiful. Our next session was creating a piece of art using color and an inspirational word followed by an hour spent with some animals at the nature house. It was hot and muggy and I was excited that our next session involved basket weaving IN THE POOL! We all got into our bathing suits and were taught how to make baskets. I was very impressed with myself that I was able to figure it out and create something in about one hour. Dinner was next and we were served a Thanksgiving style meal of turkey, potatoes, green beans and pumpkin pie. You sure have a hearty appetite when trying to keep up with the Girl Scouts! After dinner the girls sang songs and did some skits. When the girls were excused, the CEO’s stayed behind to plot out the inspirational track for the next day. Lidia Soto-Harmon led the discussion and brought more snacks and goodies for us to munch on. It was incredible meeting some of the other CEO’s: Mozella Ademiluyi, a poet, writer and storyteller; Natalie Givans, EVP of Booz Allen; Stephanie Linartz, head of Global Marketing for Marriott and more! On the first day I was hot, bothered, exhausted but inspired. I made a mental note that I would never do this again! My cabin was super far away and I had to walk half a mile to go to the bathroom. I was really worried that I was going to be up all night and not be able to sleep. Well, guess what? I slept like a baby. The weather cooled off and there was a nice breeze. Apart from getting up in the middle of the night and not being able to find my glasses or shoes and having to walk to the bathroom with a flashlight, I had a good night. I woke up in the morning energized, excited to be there and ready to be on my panel of CEO’s to inspire the girls. After a great breakfast of French toast, we went back to the amphitheatre for our presentation. By the end of the 36 hours at Camp Winona, I decided not only did I want to return in 2013, but I would like to do this every year. I felt that what I gained from the experience, the girls and the other CEO’s, far surpassed what I was able to give to the group. I was the true winner, walking away from this experience, blown away by the courage, confidence, and character of these girls, knowing they are going to make the world a better place.